Readers of these posts may recall a discussion of the theory that Emily Dickinson’s reclusive nature in later adulthood was caused by epilepsy and that her poem “I Felt a Funeral In My Brain” may have been describing the auras experienced around epileptic seizure events. I think it’s an interesting idea, a plausible one, but I also warned against reductionist explanations for art. Even recognizing that danger, I’m about to risk that sort of thing again, for what I think are good reasons. Is T.S. 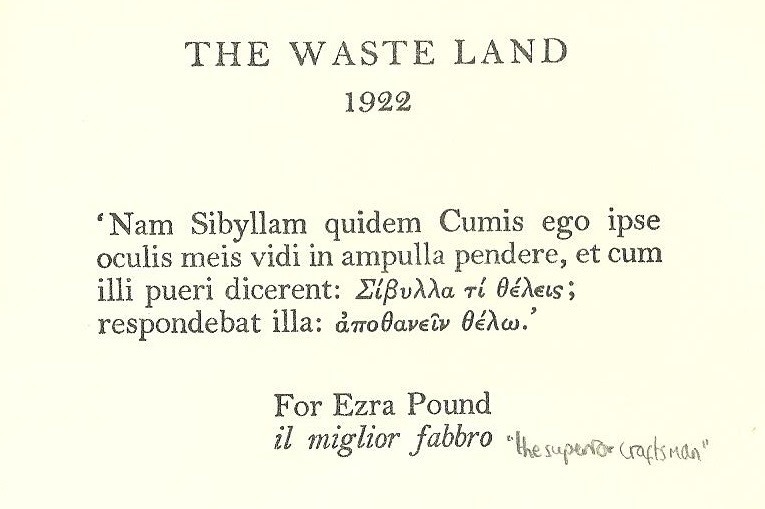 Eliot’s “The Waste Land” introduced to students later and less often now than it was in my youth? If so, I suspect this is because “The Waste Land” does not present itself as a friendly introduction to poetry. It seems proudly obscure. There’s no frank self-expression in it where a recognizable author/speaker tells us about their life and outlook. Instead, there’s a flurry of voices and characters that are barely, if even that, introduced. And there’s no interesting story, no fable or tale with a twist that carries us along. There’s a shortage of obvious similes, no “fog comes on little cat’s feet” to introduce metaphor. In my youth, all these shortcomings of “The Waste Land” as a teaching tool were overlooked because it was a landmark in the rise of Modernism, that defining artistic movement of the first half of the 20th Century, and because it was full of the stuff that made up a Liberal Education: foreign phrases, cosmopolitan settings, wide-ranging cultural references to other literary works from across time. I always find that a little Latin and Greek on the title page helps perk up the reader. And now? The odds are that if T.S. Eliot was to stand up at a Moth story-telling stage or a slam poetry event and deliver “The Waste Land” in whole or in part, that boos, snores, or some variety of non-pleasurable puzzlement would result. We are inured to a different kind of poetry, confused enough, bothered enough, by modernity and its incessant messages that Eliot’s fragments shored up against ruins seems to offer us no balm, no pleasure of recognition. I’ll offer two keys, two aspects of “The Waste Land” that can allow you entry into it. The first is: it’s intensely musical. The imagery, outside of “The Waste Land’s” overriding dry vs. wet scheme, never strays far from sounds, and all those unintroduced voices are like new strains in a composition. No wonder the Parlando project is drawn to it, because we believe that one can appreciate poetry without understanding its meaning, in the same way that you can appreciate music without being able to somehow explicate it. The second entry point, the one that risks being reductionist, is that this is a poem written by someone suffering from depression. Whatever voice is speaking in the poem, it is heard and reflected out the mouth of someone who feels it has all gone wrong, someone who cannot fully trust any other feeling other than that—other than the emotion of fear that that is the reality that any other feeling would mask. Although it must sacrifice the music, the incandescent reading of the “The Waste Land” by Fiona Shaw illuminates this aspect. Today’s episode is just a part of the first part of “The Waste Land,” but it’s the part the begins in April, our National Poetry Month. I don’t know if Eliot intended to refer to Chaucer’s “Canterbury Tales” prologue (our last episode), but it sure seems to rhyme. The opening of Eliot’s series of tales has, like Chaucer’s prologue, rain, flowers, journeys and travelers; and later in the poem Eliot will in bring birdsongs and churches. And Chaucer, who begins singing in Spring merriment, introduces at the end of the prologue the promise of “Strange strands,” and tells us that the pilgrims may be taking the pilgrimage because they have been sick. Fiona Shaw’s il miglior fabbro performance of the whole “The Waste Land” will take almost a half-hour to view. My audio piece for today will take less than 3 minutes and has music. To compare to the “Prologue to the Canterbury Tales” check out the previous post here. If you want to hear Nobel Prize winner Bob Dylan taking a run at the same part of “The Waste Land” as I performed—and making his own connection to Walt Whitman’s “When Lilacs Last In the Dooryard Bloomed” in Eliot’s opening lines, you can hear that here. But give mine a try first, using the player gadget that appears at the end of this post. Thanks for the likes and shares over the past few months, and as part of April’s #npm17, feel free to link to this blog or share this post on social media. Jeepers, this is nice & better than Bob D’s. Probably because I’m not on it. April also has the cruelest mouth, but that’s another story.